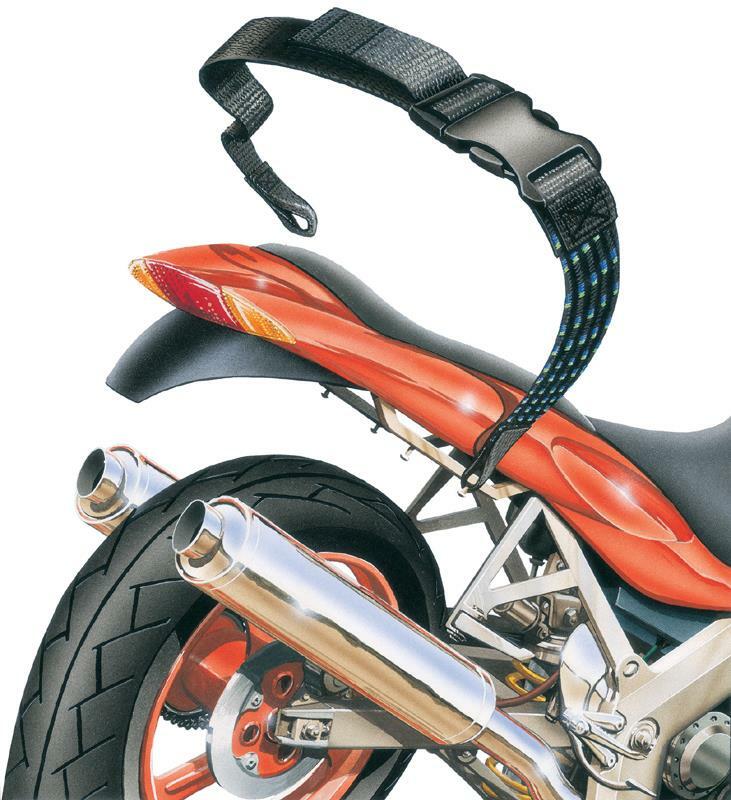 ROK ‘flat stretch straps’ are designed specifically for motorcycles to combine the best aspects of traditional bungee and tie-down straps in a simple to use package. They have four key advantages over traditional elastic straps. 1. STRENGTH - ROK straps are up to FIVE TIMES stronger than traditional elastic straps, with a recommended maximum load of 40kg (90 lbs). 2. ADJUSTABLE - ROK straps have two portions; one is elastic, so it will stretch to fit, the other is adjustable webbing. Unlike bungees they do not rely on elasticity to secure a load, which means that a wider variety of weights and shapes may be transported. 3. QUICK RELEASE BUCKLE - ROK straps shatter-resistant quick-release buckle gives easy access to luggage without removing the strap. 4. HOOKLESS - ROK straps do not use hooks to secure then to the vehicle. Instead there is a loop at each end, which can fixed onto existing luggage hooks on the motorcycle. Alternatively the strap can be wound around a grab handle, frame or luggage rack and passed back through the loop to secure it. Either way, there is no danger of hooks becoming detached or scratching bodywork. ROK straps measure 25 x 1400mm (1” x 54”) and sell in pairs for £17.00 Including VAT at 15%. They can easily be carried under the seat of most machines or even in a jacket pocket, so they are always available for lashing down a load.